We decided to focus on the Woolbrook/Manstone area for our second beach clean, very kindly hosted by the lovely Ben, Chris and Angie at the Youth Centre, the centre of the action. Unbelievably to me, over 50 people turned up and all pitched in 100%. It had been a very rainy week but the sun came out for the afternoon and the atmosphere was fantastically community oriented, and everyone seemed happy – although incredibly shocked by the sheer amount of rubbish we found. Robert Crick recently told me that he had organised a similar clean up 12 years ago, and I firmly believe we were finding 12 years worth of rubbish. Each layer was covered with mud (leaves that had dropped on it) but the bottles, sweet wrappers and crisp packets we found were perfectly intact – so worrying. We stopped after an hour so as not to wear out the goodwill of all involved – but we could have gone on and on there was so much, it was shocking. We had a fantastic response from Lidl who also cleaned up their car park, and what they could reach down the ravine – and have ordered contractors to come and get the rest out… we will see if that happens. 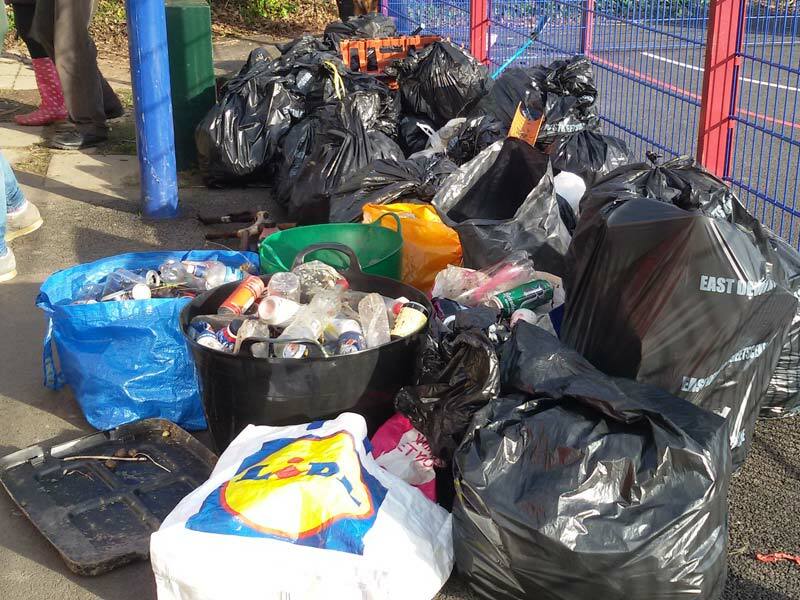 We collected over 30 full bags of rubbish, sorted out the recycling, and had it all picked up from the very full garage at they Youth Centre by Streetscene on the Monday morning following it. We spoke to some of the teenagers at the skate park, who were totally confused as to what we were doing and why… they all said they need more bins (and I agree – the two that were originally at the Youth Centre were in the garage, locks broken – is it me or is it obvious that they need fixing and re-siting, someone, please do it – I have appealed to Streetscene but so far nothing). We need decent, recycling bins, throughout the area, as well as education to the children that it isn’t #cool to chuck their rubbish around, it’s #plasticpollution and causes the exact scenes from Blue Planet that we all saw and hated. 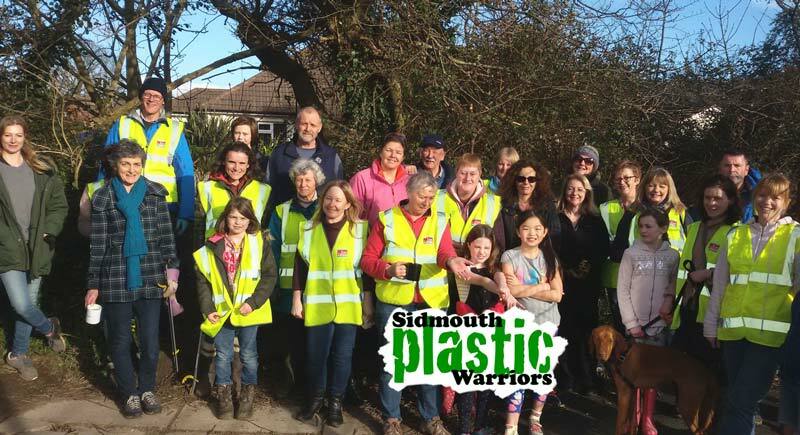 We got some publicity again after this clean up, such as from Young Devon here and Sidmouth Herald should be following tomorrow… Keeping it in the news is priority number 1 – share everything you see to our Facebook page and follow us etc on Twitter @sidplasticwar thanks! Thanks again to Angie, Ben and Chris – especially for the very well deserved tea and (home made) biscuits! This entry was posted in Clean ups, Publicity and tagged #plasticpollution, clean up, manstone, plastic, plastic waste, sidmouth, warriors, youth centre. Bookmark the permalink.